A couple of years ago, I read an article by Andy Skurka called Stupid Light: Why light is not necessarily right, and why lighter is not necessarily better. I’ve always tried to pack intelligently, rather than just aiming for the lightest possible load, but I’ve been guilty of going ‘stupid light’ a few times too. It’s all part of the learning curve from traditional to lightweight backpacker. The premise of Andy Skurka’s article is pretty simple. In aiming for lightweight packs, sometimes backpackers cut things a bit too fine and don’t take items they actually need (or they take the wrong items). I decided to leave my DSLR at home and took an old, cheap, small-sensor compact camera instead. The camera was on its way out and under-exposed every single image I took on the trail. My photographic output from that trip was poor – I should have carried a heavier DSLR or mirrorless camera. Rather than taking sleeping clothes for wearing in my sleeping bag, I just took a sleeping bag liner instead. Early in the trip, faced with cold, wet weather and few bothies, I often had wet clothes at the end of a day’s hiking but had nothing dry to change into. This led to me going to sleep wearing a damp shirt on more than one occasion. Carrying a spare long-sleeved top and long johns would have ensured I always had something dry to put on at the end of each day. This is the strategy I have used on every trip since. Finally, I didn’t pack beefy enough tent pegs at the start of the trip. High winds in Knoydart resulted in my tent falling over around me as I slept. I purchased some MSR Groundhogs in Ullapool, and I’ve been generally very happy with them ever since. 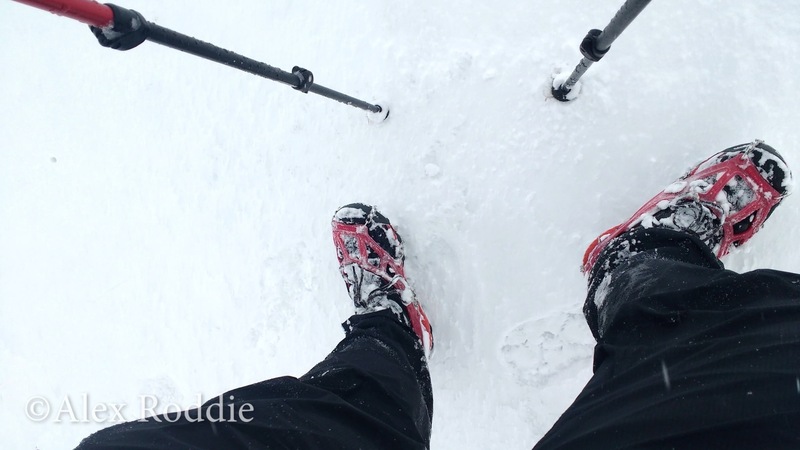 For this journey, I wasn’t sure to what extent snow and ice would affect my route, and I changed my mind several times about whether I should pack ice axe and crampons. In the end, I took neither, but would have appreciated some traction on the descent of the Theodul Glacier. I hiked this route in early May, and the weather was very cold and snowy for the time of year. I could have really used thicker gloves, a balaclava, and snow goggles. 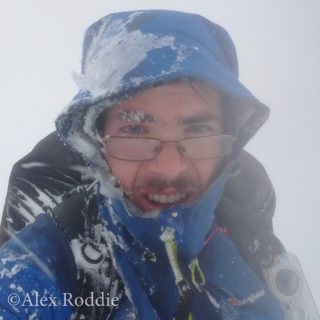 Crossing the Ossian Munros with my lightweight kit in a full-on blizzard was absolutely brutal. Mesh shoes and Microspikes were only just sufficient. If I’d encountered any more steep snow (especially firmer snow) then I would have needed boots and full crampons. However, hiking in boots would have compromised my ability to complete the route as a whole, so on balance I made the right call here. We made a lot of good calls with kit on this trip – and, in particular, the Trailstar really proved its value as a two-person shelter – but the weather was hot and we didn’t really carry enough water-storage capacity. Before tackling the Trotternish Ridge, James and I both had to buy extra containers for hauling water. In Scotland I normally carry a 500ml Coke bottle and a spare 1l flexible Source bottle (which rolls up and occupies minimal space). However, this is only enough when water is in plentiful supply. I usually keep a Sawyer filter permanently screwed to the top of the 500ml bottle and top up as I go. From now on, I think I’ll be carrying a 2l container at all times (and doubling up with a second 2l container for trips to drier areas). Those roll-up Source bottles don’t weigh much, so there’s minimal difference between a 2l and 1l container. I also had a Sawyer filter fail on me during this trip, but had no backup water purification tablets. Since James had a filter, this wasn’t a problem, but there’s really no reason not to carry a few Chlorine tabs for emergency use. I hiked a section of the HRP with my lightest pack to date, at 8.2kg2. Cutting the better part of a kilo from my normal Scottish load resulted in a few compromises, and they weren’t always wise ones. In my defence, it was my first time in the Pyrenees! I really wish I’d taken a mesh inner tent. I’d been informed that bugs wouldn’t be a problem in the Pyrenees, but I was plagued by swarms of flies (both ordinary houseflies and massive, biting horseflies). This was borderline intolerable on my camp in the forest just before Parzan, where I ended up taking refuge in my bivy bag with several hundred flies buzzing inches from my face. 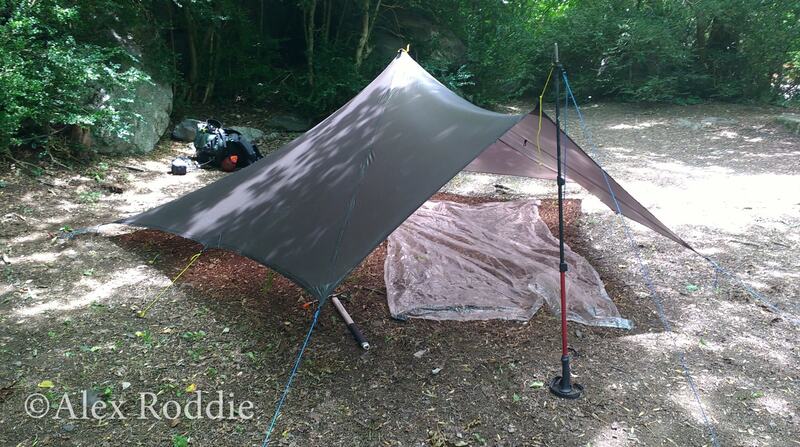 Closely related to the above issue is my choice of groundsheet. I packed a Polycro transparent plastic sheet, the same as the one I’d used with great success on the West Highland Way, Alder Trail and Skye Trail. While it was mostly fine, I experienced several torrential thundery downpours in the Pyrenees, and I think it was only due to blind luck that my pitch wasn’t flooded on at least two occasions. Next time I go to the Pyrenees I may consider taking a tub groundsheet, although there is a pretty big weight penalty. Being more careful with site selection is another possible tactic. When you remove an item from your pack, or replace it with a lighter item, nine times out of ten you need to have extra skills or knowledge that you might not have needed before. The less gear you have, the more experience you need. I think there’s a distinct correlation here. In 2015, when I started my lightweight transformation, I had to change my entire approach to mountain travel. I’m still learning. Every time I head out with a light pack, every time I push myself, I’m learning more about how little I can get away with on the trail, and – perhaps more importantly – about where my limits are, about the balance I’m comfortable with. I’ll continue to strive for a light pack, but I already know that I’ll never be an ultralight backpacker. I’ll make different mistakes in future, but hopefully I won’t make these mistakes again! Just because you can go really light doesn’t always mean you should.